ConvertKit Review - Is it the best email marketing service in 2017? Email marketing remains to one of the most efficient marketing methods. With proper implementation, it can do wonders to your business. It helps you in conveying your message regarding your products or services to the potential customers and also create relationships with them. According to a recent study by Capterra, the average rate of return on $1 spend on email marketing is around $44.This makes email marketing the best bet to invest your time and money. ConvertKit is a powerful email service provider which offers automaton capabilities without investing a lot. It gives you the ability to collect various leads via forms, allows you to create an autoresponder series and even send out email broadcasts. It also helps you in tracking your conversion and provide a reliable email deliverability. In recent times, email marketing automation has become quite important. It has become a top choice of bloggers as well as businesses who require advanced email automation. Problem with certain email providers like Infusionsoft is that they are highly complicated to learn and comes with a high price tag and its initial set up cost makes them costlier to most of the bloggers. ConvertKit comes with similar features which you have used with other email service provider before. The learning curve of ConvertKit is quite small in case you are making a switch from other email service provider. The autoresponder series in ConvertKit is known as Sequences, which is a new term which you should know. The very first thing that attracts the user towards ConvertKit is that is quite nice and appealing when you login. Everything is crisp, intuitive as well as easy to use. It comes with 3 form templates along with 4 landing page templates to start from. The templates are editable so that you can put your own headlines, images and even change colors, as per your choice. However, the templates are quite rigid, and you can’t move the elements around. Even though the designs are in limited number, they are quite nice, and you don’t have to go through mundane templates like in other services such as Aweber. In case you have never created any fully customized autoresponder series before, ConvertKit helps you out by offering nice template series of draft emails which you can follow as per your wish. While your customers or subscribers are going through your automated sequences, there may be times when you wish to send out one-off emails also. You may even want to do a product promotion or wish to announce a webinar which you are going to put together. For such instances, you can send out a broadcast email. ConvertKit has such great features which make this process work even better and makes your life easy. In order to start your broadcast, you have to choose your subscribers to whom you wish to send out the emails. ConvertKit is different from other services such as Aweber, where all of your subscribers are grouped in separate lists. In ConvertKit, all of your subscribers are all in one big account list. It provides your flexibility in segmenting or filtering your subscribers which allows you to send a particular set of people. You can also segment leads subscribers to any specific Sequences, Forms or even Tags. You can also segment your subscribers based on Date too. It comes with a pre-made filter which solely targets your cold subscribers too. Now in the next step, you have to write the email. It doesn’t have any sophisticated drag and drop editor which you have in Mailchimp which can be a turndown. So creating fancy email newsletters is hard to come by. However, in case of simple text and HTML emails, it is quite capable and very simple to use. This makes an obvious choice for those who want to send simple emails in bulk. ConvertKit introduced this feature in order to segment subscribers within emails. It is quite neat. However, few people may get intimidated by the syntax as it does look like programming. For instance, if you wish to offer special discounts to your selected customers, VIP tag, while others get normal price. Then you can put a nice tag for specified persons while giving rest of the information to normal customers. Now the subscribers who have the VIP tag will receive one version of the email while the rest will see the other. This is one of the best feature of ConvertKit and great implementation of email segmentation. Whenever you send out broadcast emails, there are many subscribers who don’t open your emails. It may be because of a variety of reasons such as either they don’t find the email headline attractive enough to open the email or they didn’t have the time to open it. ConvertKit has a great feature which allows you to re-target these people who dint even open your emails due to any reason, at the first time. In order to do so, just click on any previous broadcast emails. On the stats page, there you will find a Resend to Unopens button. When you press it, you will get to broadcast email workflow again, and this time you will only be targeting these unopened subscribers. It is quite a useful features, and it maximizes your email outreach as you send out. This is quite important for bloggers who wish to send newsletters to their subscribers regarding their latest e-books or information of webinars especially because they want the maximum reach. Same is for businesses which are offering discounts and wish to reach out to a maximum number of customers to avail their offers and boost up their sales. This feature is quite useful for e-commerce businesses. In case you wish to use lead magnets in order to collect more leads, this tool makes it quite simple for your subscribers to double-opt-in. Instead of standard and quite mundane opt-in email, the visitors will go through this email whenever they subscribe to your newsletter. Whenever the subscriber clicks the button in order to download their lead magnet, ConvertKit will confirm them automatically. This will surely lead to better optin-rate. This feature is quite useful for businesses which want more leads to offer their services to more number of prospective clients so that to convert them into their customers. Its automation feature is one of the best feature you can find as it is quite simple to create. Its automation feature is a game changer when it comes to email marketing as it allows you to automatically segment your lists into various subscribers according to their similar interests. 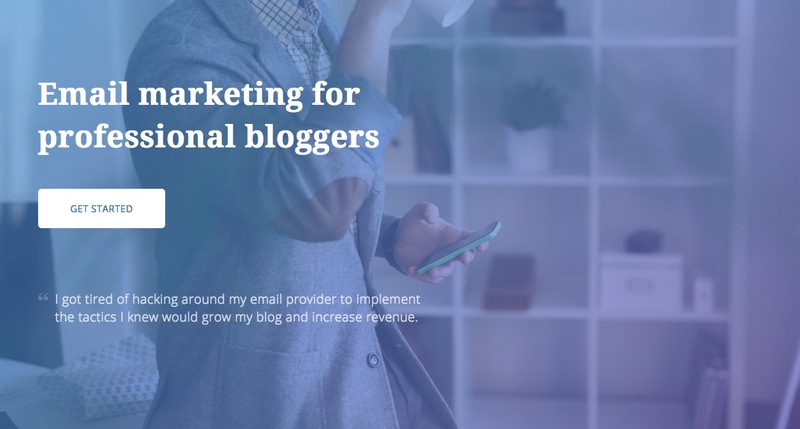 So instead of sending an email broadcast to the entire list, you can easily send your emails to more targeted segment and cater to a smaller subset of your subscribers. It allows you to focus on those subscribers who are more likely to avail of your services. It currently offers 8 various triggers and 7 different actions. By selecting the trigger, you are allowed to perform any chose action which is specified on the page. For instance, you have Sequences for promoting any of your new books. You can then create a simple automation rule which only tags the one who clicks on the specific link which has been included in the email by you. The tag can be descriptive like your book name in order to indicate an interest in your book. As people read your email sequence, you will get a segment of subscribers who are especially interested in your book. When you decide to send follow-ups in the feature, then you are able to target that particular segment with precision. This service is quite helpful for the bloggers who wish to send out their e-books or PDFs to their subscribers of their collection and information that they have collected or created. In case you have a business, and you want to offer a special discount to your customers in one email or a bonus chapter in another. Since you have a segment which you can target, you will find more engagement along with higher conversions from your subscribers. It will be quite a useful tool for businesses offering their products and services and are indulged in promoting them. Another favourite way to segment subscribers is by buyers vs. non-buyers. In order to enable this, ConvertKit has integrations with various famous shopping carts such as Shopify, Gumroad, and SamCart. In case your shopping cart is not included in it, then you can use ConvertKit’s Zapier support to integrate it. Once you integrate a shopping cart, it provides you with an additional trigger called Purchases a product which you can select. Using this trigger, you can tag users by product name which allows you to know which subscribers have purchased your product. For people who have purchased your products, you can also send them follow-up emails and inform them about product updates, offer upsells or even ask for testimonials. Those people who haven’t bought your product, for them you can take them to the main course and work on them to offer value to them in order to make them future buyer of your product. This feature is quite useful for e-commerce websites. It allows you to segment your buyers from non-buyers. As the buyers who have previously purchased a product from your site, they are more likely to purchase another product from you. This segmentation allows you to offer new products to these existing customers. Customer testimonials remain to be an important factor for potential buyers to decide whether to purchase a product or not. With this service, you can ask for testimonials, which will help in the growth of your business. With the information on non-buyers, you can attract them with more discounts. You can also provide new promotional offers to your existing customers too to attract them to make a repeat purchase. When you send an email to any of your lists, it only appeals to a small set of subscribers and increases the risk of alienating people who aren’t interested in your product or services. This often led to more number of unsubscribes, spam complaints and dislike towards your email blasts. You will definitely like to avoid this in order to grow your email list. When it comes to price, ConvertKit is little expensive than its direct competitors. With a list of 1,000 subscribers, ConvertKit has a price point at $29 per month, which is same as Aweber. But has the number of subscribers increases, it gets more expensive. For 5000 subscribers, it cost $ 79 per month, and for 10000 subscribers, its price is $119 per month. ConvertKit does count the subscribers who are on multiple courses as one distinct subscriber. It means that you won’t get charged extra for the same subscriber on multiple lists, which you would have in case of Aweber and MailChimp. ConvertKit doesn’t come with any free trial. But it does offer a full 30-day money back guarantee in case you don’t find it fit for your business and you can avail your refund. It has a clean and intuitive interface which makes it more appealing. It is perfect for implementing Content Upgrades which increases reach. It is Tag based which allows having proper segmentation of subscribers. You are not charged for duplicate subscribers, unlike other services. It has automatic double-optin when you use lead magnets. You can use tags to personalize emails and focus on specific customers. It has Zapier integration for integrating with shopping carts. It isn’t able to able to handle more complex automation which is required for large businesses. The absence of No A/B split testing features doesn’t allow you to test your email efficiency. It doesn’t come with a free trial, and you have to pay even for trying it out. However, you have a money back guarantee. ConvertKit is a quite an interesting email service provider in the market. It has been getting traction among big-name bloggers who have started to use it for managing their lists. It has also attracted businesses to attract their customers especially the e-commerce business. It has great and easy-to-use UI design and comes with great automation rules. It is intuitive as well as easy to use. Its segmentation allows you to target a specific set of customers which increases your responsiveness, open rate and generate more leads. Automation is considered to be the future of email marketing. If it is properly implemented, it can give you extreme control over your emails in order to send to your lists which results in more conversions as well as sales for your business. It also allows you to target existing customers and provide you with an opportunity to target them specifically. There is a lot of potential to ConvertKit, and we expect that there will be much better features added to it in the time to come. With this, we wrap up our review of ConvertKit. Do let us know about your views regarding our review. You can post your comments in the section below. It doesn’t come with a free trial, and you have to pay even for trying it out.